The National Security Agency and the FBI are tapping directly into the central servers of nine leading U.S. Internet companies, extracting audio and video chats, photographs, e-mails, documents, and connection logs. “They quite literally can watch your ideas form as you type,” an unnamed intelligence officer toldBarton Gellman and Laura Poitras of the Washington Post. “They” are the National Security Agency, and the Post report reveals that an N.S.A. 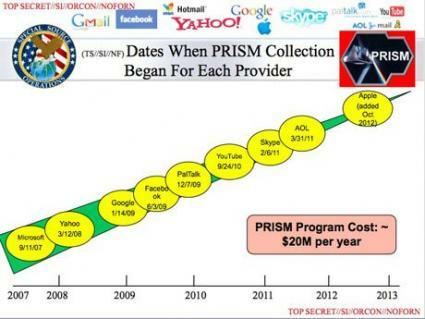 program called PRISM has, for the past six years, been “tapping directly into the central servers of nine leading U.S. Internet companies, extracting audio, video, photographs, e-mails, documents and connection logs that enable analysts to track a person’s movements and contacts over time. “They quite literally can watch your ideas form as you type,” an unnamed intelligence officer told Barton Gellman and Laura Poitras of the Washington Post. This is the second story in the past twenty-four hours with deeply troubling constitutional and privacy implications—the first was the news, reported in the Guardian, of a secret court ordercompelling a Verizon subsidiary to turn over call records to the N.S.A. (It is increasingly clear that such orders went to companies well beyond Verizon.) We have gone through the day with Administration spokesmen and friendly senators telling us that we shouldn’t worry so much about the Verizon case because of the supposedly abstract quality of metadata. That was always a hollow defense—metadata reveals a great deal that is properly private, as Jane Mayer explains—but it is especially meaningless now, in the face of what appears to be a sprawling effort to look over the shoulders of Internet users. After the Post and Guardian published their stories, James Clapper, the Director of National Intelligence, said that the activities they described were “pursuant to section 702 of the Foreign Intelligence Surveillance Act” and “entirely legal,” and that the reports contained “inaccuracies” he didn’t specify. (Meanwhile, other media outlets confirmed their basic account.) Clapper said that the intended targets were foreign, and that information about Americans was “incidentally acquired.” What is incidental to the government can, of course, be central to its citizens. (Foreigners whose E-mail is read might mind, too.) Clapper also called the “unauthorized disclosure” of the program “reprehensible”; this may not be the best moment for the Administration to be making such an argument for secrecy. The N.S.A.-briefing slides mix corporate cheer and disturbing revelations. They look like sales-meeting charts. There are the logos of the nine companies involved: Microsoft, Yahoo, Google, Facebook, PalTalk, AOL, Skype, YouTube, Apple. That is the order in which they joined PRISM. The Post describes Apple as a holdout (one that acquiesced, coincidentally or not, after Steve Jobs’s death). Thursday night, the companies involved issued denials, or rather disclaimers, that turned on whether they had given the N.S.A. direct access to their servers or just complied with specific requests. Google, for example, said, “From time to time, people allege that we have created a government ‘backdoor’ into our systems, but Google does not have a ‘backdoor’ for the government to access private user data.” An Apple spokesman, in a statement, said that it, too, relied on court orders: “We have never heard of PRISM.” So why did PRISM seem confident about Apple? Was the N.S.A. bragging internally, or were the companies left out? Or may the dispute, again, simply be about whether the corporate servers were the mechanism for all this or something else was? The Post pointed to a note in the documents about “equipment installed at company-controlled locations.” Each company still needs to give a better account of what it did and what it thought its options were. The slides refer, too, to another metadata program, code-named BLARNEY, the summary for which was “set down alongside a cartoon insignia of a shamrock and a leprechaun hat.” PRISM’s logo looks like a teen-ager’s drawing of the “Dark Side of the Moon” album cover. The tackiness is a depressing touch. And why did President Obama sign on, not only to the program but also to the idea that it should grow? According to the Post, the N.S.A. briefing “described the new tool as the most prolific contributor to the President’s Daily Brief.” Did all of this appeal most to Obama's fear, his curiosity, or a certain sense of his own cleverness? He seems to have acted as a steward not of the law but of some of its worst distortions under his predecessor. This Administration seems to have forgotten that Americans have a perfect right to keep secrets. If there is a legal basis for these programs, something is wrong with the way the laws in question are written or read, in a way that may be up to the Supreme Court, and, through political mechanisms, the public to address.